The only thing better than spending time with our granddaughter is getting photos and updates about her latest accomplishments, discoveries and antics. Recently our daughter texted us a picture of her smiling proudly with a bowl of spaghetti turned upside down on her head. 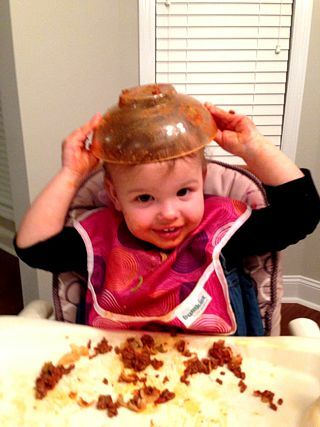 She had put the spaghetti bowl on her head, flashed her mom a big smile and proclaimed, “Hat!” What a little creative genius? Children are wonderful examples of how to let our imagination soar and embrace our creativity. Unfortunately, many of us lose that creative freedom as we leave childhood behind. But an interesting thing happens as we move into the second half of life. Changes in our brain enable us to reconnect with the creative spirit we embraced as a child. Not only are we able to become more creative as we age, doing so enhances our physical and mental health. Older brains use both hemispheres of the brain more efficiently, enabling the brain to become more creative as life progresses. Growing new brain cells is a lifelong process. brains are better than younger brains at many types of intellectual tasks. Adversity and loss that accompany later life actually encourage creativity by forcing change. Participating in creative activities results in better physical and mental health. Open a dictionary and find a new word. Use it in a sentence. How is an iceberg like an idea that might help you solve your problem? Read a different newspaper. If you read the Wall Street Journal, read the Washington Post. What is your most bizarre idea? Listen to a different radio station each day. Ask the most creative person you know. Ready to start living a more creative life? Remember, there are an endless number of activities that give us opportunities to be creative. Music, drama, photography, painting, cooking, decorating, writing, gardening, crafting, woodworking, dancing and sewing are just a few. What excites you? Below are some ideas and questions to get you started. List three creative activities you have wanted to explore or spend more time doing. How will your life be different if you engage in this activity? What do you need to do or have to begin? This entry was posted in Debbie Grovum, TOPIC - Health, TOPIC - Keeping Active and tagged aguing brains, seniors and brain health. Bookmark the permalink.